My vegan oatmeal raisin cookies are a healthy, gluten-free twist on everyone’s favorite breakfast cookie. 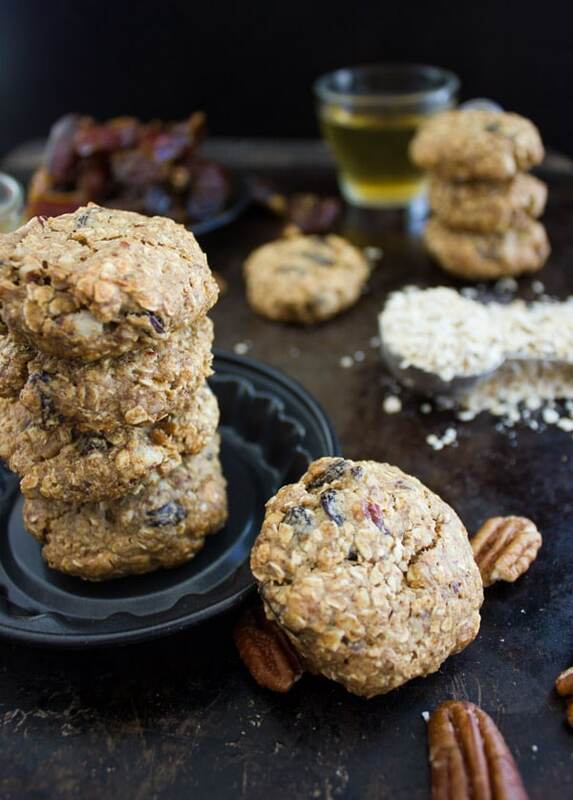 An easy-to-make, wholesome, naturally sweetened oatmeal cookie perfect for fuelling your day! 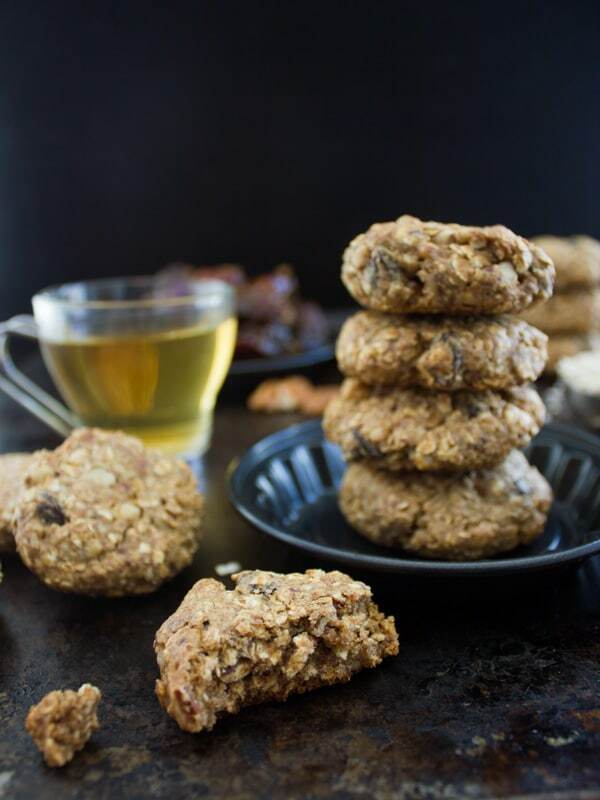 This soft and chewy vegan oatmeal raisin cookies recipe is like the healthified, no sugar added, utterly soft and vegan, gluten-free version of my already healthy oatmeal raisin cookies! Absolutely straightforward. No beating or fussing around techniques, you just can’t go wrong! Well, I can’t believe I am making an even healthier version of my all-time favorite healthy oatmeal raisin cookies recipe! I’ve been asked at one of my cooking classes to make a vegan version, and a no sugar added version. So I thought I might as well make it gluten-free with zero flour and no butter substitutes either..
Well as un-appealing as this may sound to some of us, the result came out absolutely fabulously deliciously appealing! Yes, that’s a guarantee. You might feel you’re losing plenty of your cookie enforcement ingredients here, but they’ve all been substituted in the best way possible–so once they’re baked and you take the first bite, you won’t miss a thing! 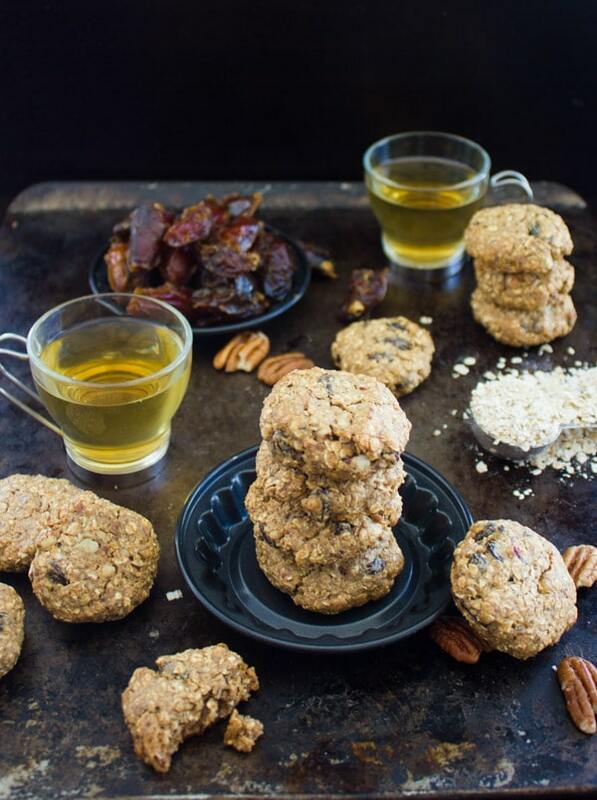 Now what should you expect out of these vegan oatmeal raisin cookies, you may ask? To start off, they are extremely chewy. No crisp factor at all (remember no butter, sugar or flour). They’re not soft like an energy ball because these oatmeal raisin cookies are baked. Also, they have a really nice cookie-like chew. They are perfectly sweet. I mean you wouldn’t be inclined to add a single granule of sugar! And this sweetness is purely natural as it comes from pitted pureed dates. 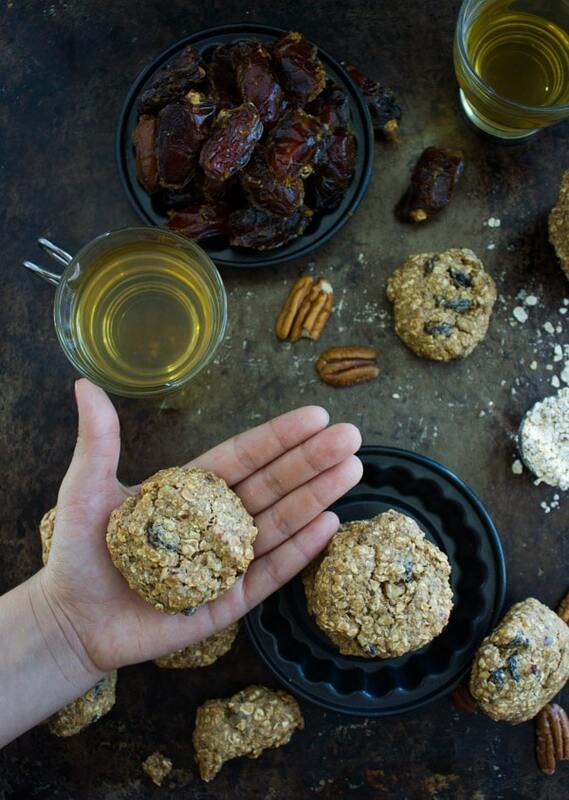 The type of dates in these vegan oatmeal raisin cookies makes a difference in the flavor only. Go for your favorite, if you have one, or use whatever you find on the shelf. Any type would be perfect. And for the oil/fat factor, I used almonds. You could use almond butter, but I ran out. So I basically pureed whole almonds in a food processor adding dates until the mixture was a smooth runny paste. 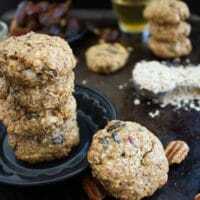 And what a fabulous flavor almonds add to the vegan oatmeal raisin cookies! As for the binder, instead of an egg, I used a mixture of ground flax, chia seeds, and water. You could substitute this mixture with 1 egg if you’re not vegan. All goes into the food processor too. At this point, I poured this smooth wet mixture into a bowl, added to it oats, raisins, chopped pecans and mixed them with a spatula. Then I shaped the cookie batter into golf size balls, flattened them a bit and baked them right away. The thing is, these chewy vegan oatmeal raisin cookies do not spread during baking. So if you want to make them into that classic flat cookie shape, you’ll have to flatten them yourself. They just puff up a little bit which gives them a nice cracky cookie look on the top. When it comes to variations, I can imagine adding chocolate chips would be absolutely amazing here! Cranberries, different types of nuts and dried fruits. Then let’s think spice! I opted for only cinnamon today, but chai spice would be oh so perfect. Something like this orange chai spice date muffins: super good for you power breakfast muffin! But then even vanilla would be absolutely wonderful here too. The flavor of the dates and almonds would completely shine! 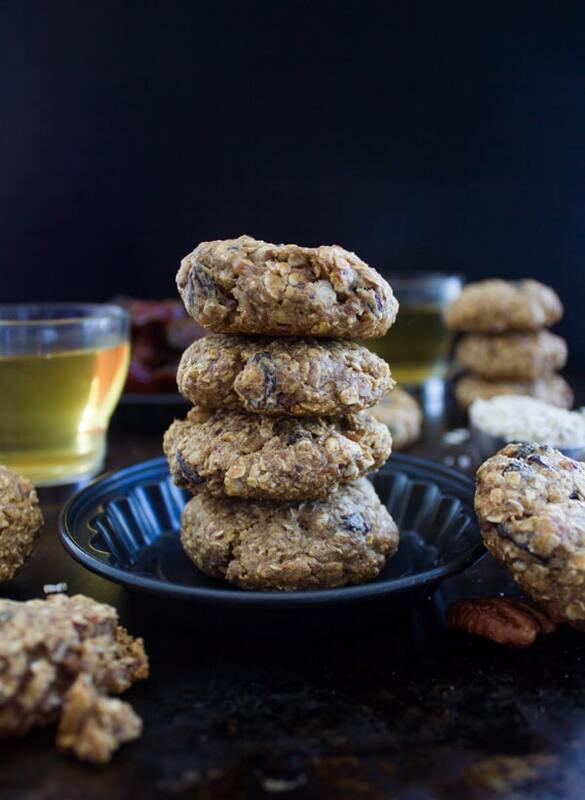 So think about how you feel like flavoring these wonderful vegan oatmeal raisin cookies and have them your way! Or try different add-in options while using the base ingredients as a base for the cookies and have yourself a different breakfast power cookie every time! Enjoy! 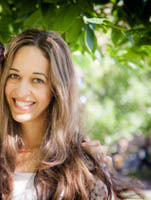 Instead of almond butter, you can just process a cup of almonds in your food processor, adding the dates as you pulse. Store-bought flax eggs work well here, but I like to make them myself by mixing 1 tbsp each of ground flax seeds and chia with 1 tbsp of water. Feel free to add cranberries, chocolate chips and any chopped nuts to the cookie batter! 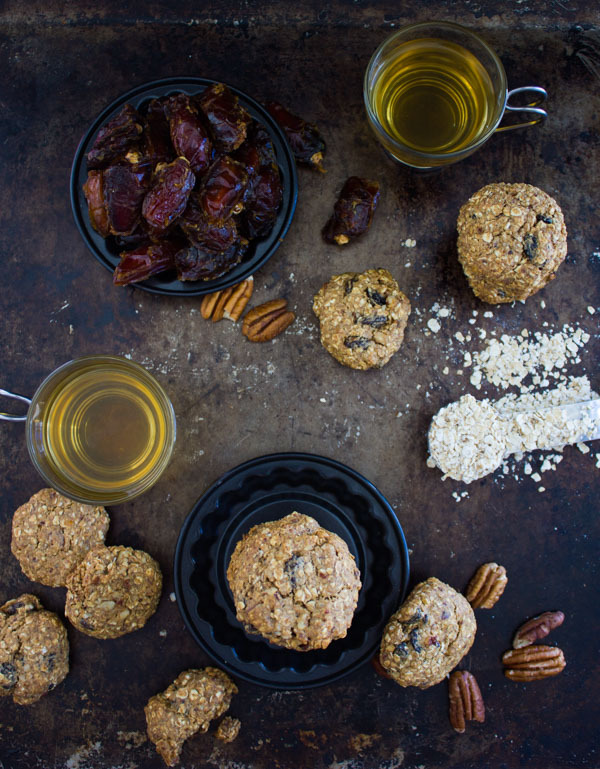 My vegan oatmeal raisin cookies are a healthy, gluten-free twist on everyone's favorite breakfast cookie. 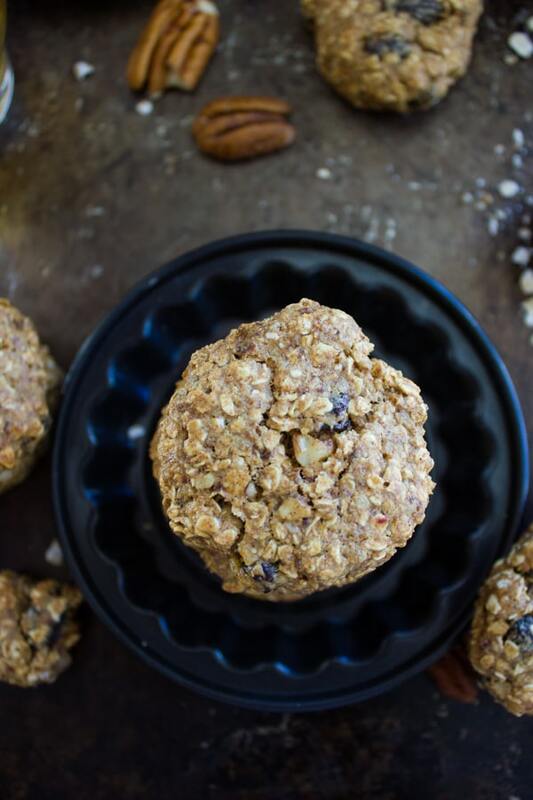 An easy-to-make, wholesome, naturally sweetened oatmeal cookie perfect for fuelling your day! Mix the flax/chia egg and set aside. In a food processor, add the almond butter and dates, and mix until smooth. Add in the chia/flax egg, cinnamon, baking powder, and process again until smooth. Then remove the mixture from the food processor and put it in a large bowl. Add to that the oats, nuts, and raisins and fold them in with a spatula. Scoop up gold size balls of cookie dough and place them on apartment lined baking sheet. Bake for 12-15 mins (depending on the size) until the edges are set and firm, while the centers still look a little soft. Remove them from the oven and cool them for a few mins. Enjoy! Oh I just love oatmeal cookies and so does my oldest son! We will have to whip up a batch of these when we make our holiday cookies next week! My favorite cookies! These will be great to have on hand this week! Delicious!